The background is ink blended through a falling heart stencil (Simon Says Stamp). The sentiment is a sticker from the Simon Says Stamp February 2016 card kit (Crate Paper). Supplies: paper – Neenah Classic Crest Solar White, Stampin’ Up! Real Red, inks – Stampin’ Up! Real Red, Tim Holtz/Ranger Distress Ink Picked Raspberry, Spun Sugar, dies – Lawn Fawn (stitched rectangle), Spellbinders (heart), stencil – Simon Says Stamp, sequins – Doodlebug Designs, metallic hearts – Crate Paper, glitter – Stampin’ Up!, sentiment sticker – Crate Paper. 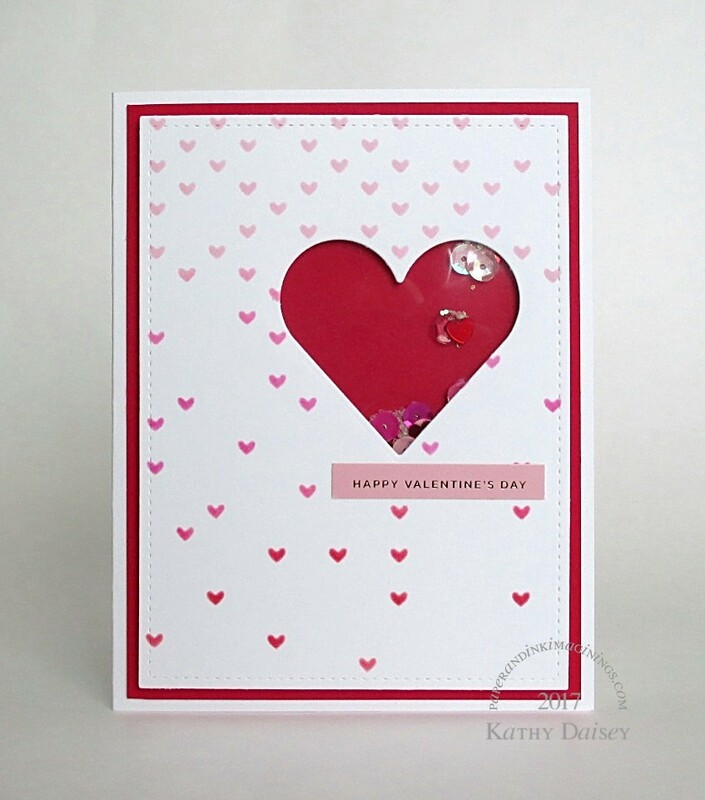 Categories: card, Valentine's Day | Tags: card, Crate Paper, Doodlebug Design Inc, Lawn Fawn, Neenah, Ranger, Simon Says Stamp, Spellbinders, Stampin' Up!, Tim Holtz | Permalink. I love the cascading hearts in shades of pink. A very classy Valentine card, I think! Thank you – I was going for something I could send to an adult. I’m glad it worked for you!